Healthy foods are all around; you just need to know how to look for them. Unfortunately, unhealthy foods are lingering on every corner as well. If you aren’t careful a seemingly healthy snack could undo your diet plans for the day. Learning strategies to spot healthier foods can be a huge boost as you follow your medical weight loss program and get lipotropic injections in Los Angeles. One way that you can start improving your eating habits right now is to become more cognizant of the calorie contents and nutrients in the foods you already eat. Check the portion size: Don’t assume that a bottle, bag or box is one portion. Prepackaged foods are famous for tricking people into eating more than they think by advertising a low calorie intake per serving, but having remarkably small and unrealistic servings. Evaluate the daily percentages: The percentages along the right side of the food label indicate how much of your daily value this item is providing. Try to find items that are low in fat but high in other nutrients like protein, vitamin C, iron and calcium. 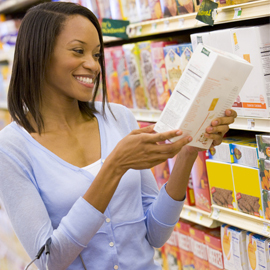 Read the ingredients: You’ll know the primary ingredient in any given item by reading the list of ingredients either below or to the side of the nutrition label. Items are always listed with the primary item first. If the first item is sugar, that is a good indication that this may not be the best snack. Reading food labels can be a big boost to you and your medical weight loss progress as you get lipotropic injections in Los Angeles. You may be very surprised at first at how many seemingly healthy items are actually hiding plenty of sugar and fat. Do yourself a favor and review nutrition labels before you take your first bite!